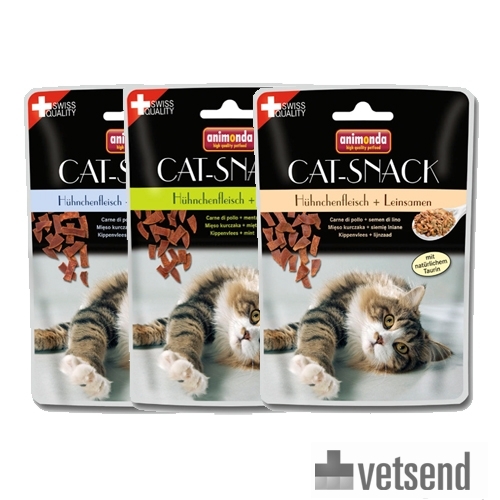 Animonda Cat-Snack, with a crispy texture, strengthens the chewing muscles and promotes teeth cleaning. Animonda Cat-Snacks have a crispy texture that strengthens the muscles used for chewing and promotes clean teeth. Available in 3 different flavours, all of which are grilled chicken-based. These snacks are guaranteed to contain no cereals, sugars or preservatives. The snacks are packed in a practical, resealable bag so that they stay fresh and tasty. Mint provides your cat with fresh breath. Ingredients: chicken (99.5%), mint (0.5%). Have you used Animonda Cat-Snack before? Let us know what you think about this product. My cat is very picky when it comes to snacks but she simply loves these.